start in BINGEN, WA . 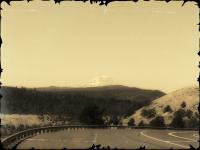 HEAD west on HWY 14 . turn off towards WHITE SALMON ,WA on to hwy 141. Take hwy 141 north until you reach the town of BZ CORNER ,WA. from there, take the BZ-GLENWOOD HWY northeast (to do the route I'm describing, do not continue into TROUT LAKE, WA) towards Glenwood, WA. once you are on the bz-glenwood hwy, there will be some very nice curvy sections, along with some very fast sweepers, and a few long straights. once you get into GLENWOOD, WA, MAKE A RIGHT on Main St. This road will head out of town and change names to GLENWOOD HWY and later change names to GLENWOOD GOLDENDALE RD and take you down towards GOLDENDALE, WA (yet you will NOT make it all the way to GOLDENDALE). The road will come to a " T ",at this point, you need to take a right on to Rt 142 and take it into and through the town of KLICKITAT, WA. from klickitat on, you will have lots of good sweeping turns, some tight stuff, all the way down to hwy 14 and the end point of Lyle, WA. enjoy the ride !! far more traffic, tourist's,and revenue collectors ( A.K.A. POLICE ). ": myspace.com/lade1721. Decent scenery in places , a few great views ( if you can stop in such a fun section ,you'll see ). a very nice mix of very fast sweeping turns, with a few long straights, tight twisty sections, and lots of good switch backs. pavement quality gets a little rough at times, but does smooth back out. there are areas of this ride that are open range, which means, for those of you not familiar with the term, that there could be cows (or other animals) on the road as they are not penned in by fences. I've never seen any, but that's not saying they aren't there. 3 gas stations on the loop, few decent spots to eat. on September 18, 2014 2 out of 2 members found this review useful. Beautiful ride with ample curves. Almost no traffic (hwy 141 might have some). Nice views of My Adams and the Klickitat river river and canyon. on October 15, 2010 2 out of 2 members found this review useful. Great ride. Beautiful in Spring, Summer or Autumn and lots of nice curving roads far away from traffic! on March 20, 2017 1 out of 1 members found this review useful. Just got home from this route and boy was it fun! Definitely one of the best I've been on. Hoping to head back out on it later with a go pro. on September 8, 2016 1 out of 2 members found this review useful. BZ Corner to Glenwood is one of my all-time favorite roads. A nice variation of this route is to take the Klickitat Appleton Road towards Appleton. From Appleton go south on Canyon Road to Old Hwy 8. From there go East or West (better) to get back onto Hwy 14.
on June 26, 2013 1 out of 2 members found this review useful. This ride is beautiful and an quick trip to the stonehenge replica on the Columbia River, or the Mary Hill Winery. I don't write reviews much but I figured this was such a great ride that I would share with everyone. on April 23, 2012 1 out of 1 members found this review useful. One of my favorite roads in WASHINGTON. on August 26, 2009 1 out of 2 members found this review useful. Fantastic road. Perfect blend of tight turns and mild sweepers along the Klickitat river. Not too heavily traveled, no gravel, plenty of opportunities to pass slower vehicles. on July 25, 2017 0 out of 0 members found this review useful. Beautiful ride. Recommend going during the week, less traffic. on November 4, 2016 0 out of 1 members found this review useful. One of, if not the best local rides for those of us that live in the Vancouver, WA area when a trip out the Columbia River Gorge oh WA Hwy 14 is included. I recommend taking this in the reverse of the direction described i.e. starting in Lyle, WA and ending in Bingen, WA as the views of Mt. Adams are better going that direction. on November 4, 2016 0 out of 0 members found this review useful. One of the best local rides for those of us that live in the Vancouver, WA area. I recommend doing the ride in the reverse as it's described here, in other words begin in Lyle, WA rather than end there. Better views of Mt. Adams when taking it that direction. on September 8, 2016 0 out of 1 members found this review useful. We've ridden this route many times and it's always beautiful. HOWEVER, today the tar snakes in the little town of Klickitat were scary bad. BE CAREFUL.